The Hugh and Hazel Darling Library serves the information and research needs of the Hope International University community by providing access to information resources and developing information literacy for lifelong learning. Hugh and Hazel Darling Library houses more than 65,000 books, audiovisuals, and print periodicals. The library also provides access to nearly 90,000 e-books and thousands of eJournal articles through various online research databases. View Hugh and Hazel Darling Library Hours for today’s current date. Our online research databases are open to students for use 24/7. Darling Library staff is here to assist you with your education goals. To contact a staff member search through our directory. Darling Library borrowing privileges are extended to students, faculty, and staff of Hope International University by registering in the Library and presenting a current University ID card at the Circulation Desk. Looking for a book to help you with your research paper? Or maybe a journal article on the latest work in your field? We provide the tools necessary to help you locate different resources in the library. 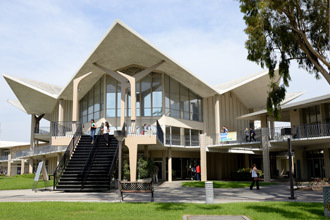 The Library is located on the Fullerton main campus of Hope International University between Nutwood and Chapman, west of the 57 freeways. Library occupies the first two floors of the “Center Core” of the Nutwood building.